Retina Vitreous Consultants has established the Macular Degeneration Center of New Jersey in our offices as a resource for the ever-growing portion of the maturing population with both wet and dry forms of macular degeneration. Complete primary diagnostic evaluation, therapeutic pharmacologic and laser intervention, review of potential inclusion in clinical trial research, and referral for low vision rehabilitative services are provided at our Center. We are the pioneer group in the entire state of New Jersey to offer the surgically Implantable Miniature Telescope (IMT- Vision Care Ophthalmic Technologies) for the treatment of severe vision loss due to macular degeneration. Please schedule an appointment to determine if you or a family member is a candidate for this recently FDA- approved technology. Early Dry Age Related Macular Degeneration- Note multiple fine drusen in macula. Age-Related Macular Degeneration (AMD) is the number one cause of vision loss amongst Caucasians in the United States. Macular degeneration will rarely result in total blindness because it does not affect the peripheral vision. Possible risk factors contributing to more severe forms of AMD may include cigarette smoking, high blood pressure, high cholesterol and triglycerides, dietary habits, and family history. Regular eye exams are highly recommended to detect macular degeneration early and to begin intervention, if necessary, to prevent permanent vision loss. An Amsler grid is a very effective tool that you may use in the home or office to detect any subtle changes in your vision. There are two kinds of AMD: “wet” (neovascular/exudative) and “dry” (atrophic). Although only 10-15% of individuals with AMD have the wet form of the disease, the majority of patients with profound central vision loss, however, suffer from this form of AMD. Neovascular means “new blood vessels.” Accordingly, wet AMD occurs when fragile new blood vessels grow from under the macula and cause bleeding, swelling, and scar tissue formation that ultimately leads to damage to the macula and subsequent central vision loss. Anti-angiogenic therapy and laser surgery are effective in reducing the severity of vision loss. In many cases, stabilization of the disease and visual improvement may occur if a patient is properly diagnosed and treated in the appropriate fashion. Dry AMD is much more common than the wet variant of the disease. Patients with dry AMD do not experience new blood vessel growth. Symptoms of dry AMD may also include blurry and distorted vision. Clinical findings such as thinning (atrophy) of the retina and its underlying supporting cells, the retinal pigment epithelium, as well as, deposits under the retina called drusen, may be found in individuals with dry AMD. Vision loss with dry AMD is slower and often less severe than with wet AMD. A recent study published by the National Eye Institute (Age-Related Eye Disease Study) has found that a specific combination of high dose anti-oxidants and zinc taken as an oral preparation may reduce the risk of vision loss in certain patients with macular degeneration. ARED vitamins are available for purchase at our office. Retina-Vitreous Consultants is an active participant in multiple national and international collaborative clinical research trials investigating the use of intraocular drug preparations in reducing the severity of macular degeneration. 72 year old man with wet AMD of the right eye. Note blood within the macula. Same eye with complete resolution of blood following serial injections of Lucentis. The treatment of neovascular or “wet” age-related macular degeneration (AMD) has evolved significantly in the past several years. Anti-angiogenic therapy is now considered the treatment of choice for patients with wet AMD. Scientists have identified a protein known as vascular endothelial growth factor (VEGF) that is found in unusually high concentrations in the eyes of patients with wet AMD. 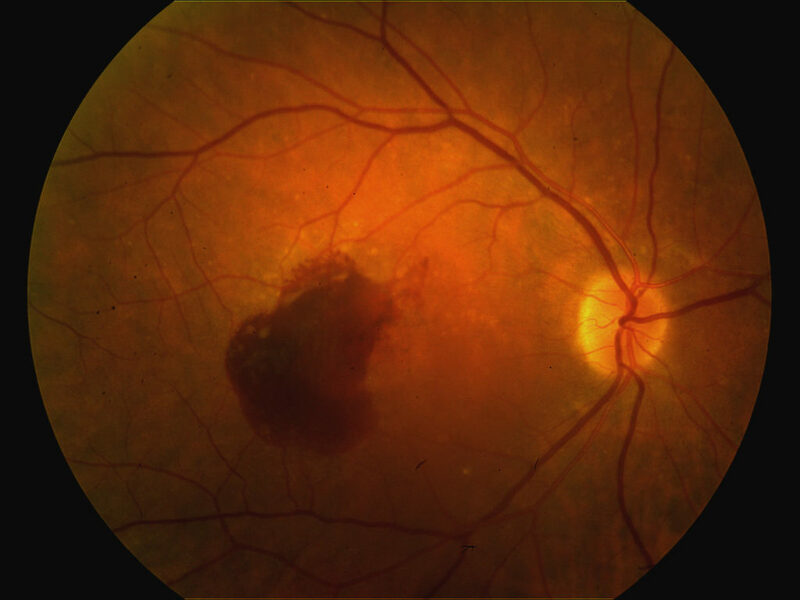 VEGF is “angiogenic” in nature, as it is believed to be a major factor in the development of the abnormal blood vessel and scar tissue network that may be observed under the retina in patients with neovascular AMD. Drugs such as Lucentis, Eylea, and Avastin, are injected directly into the eye, and are effective in reducing the concentrations of VEGF within the eye. These formulations are “anti-angiogenic,” in that they foster regression of abnormal blood vessel and scar tissue growth under the retina thus minimizing the swelling and bleeding that causes vision loss. Stabilization of wet AMD and even improvement of vision are hopeful benefits of anti-angiogenic therapy. Dr. Kanter will review with you the differences between the various drugs to allow you to make an informed decision about your treatment for macular degeneration. Retina Vitreous Consultants is an active participant in national and international clinical research trials investigating the efficacy of many of these drugs in the treatment of neovascular AMD. There is particular excitement in the scientific community about potential new agents such as brolucizumab and implantable intraocular drug reservoirs in achieving equivalent vision gains to Lucentis and Eylea while extending the usual interval between successive treatments in patients with AMD. Stem cell therapy, gene therapy, and combination therapies involving various established modalities are being investigated in clinical research with the eventual hope of reducing the risk of vision loss. Photodynamic therapy is another intervention that may be used in combination with anti-angiogenic therapy in the treatment of patients with severe wet AMD, as well as, other macular conditions that result in vision loss, such as, central serous chorioretinopathy and polypoidal choroidal vasculopathy. Visudyne, a light-sensitive drug, is injected into the vein of the patient and then accumulates in the abnormal blood vessel and scar tissue complex under the retina in the individual with macular disease. A special laser is then used to “excite” the drug, causing a photochemical reaction that results in the hopeful closure of the abnormal blood vessel network. Various protocols are being developed to investigate the potential role of using both anti-angiogenic therapy and photodynamic therapy to maximize the efficacy of treatment in patients with poorly controlled wet AMD. 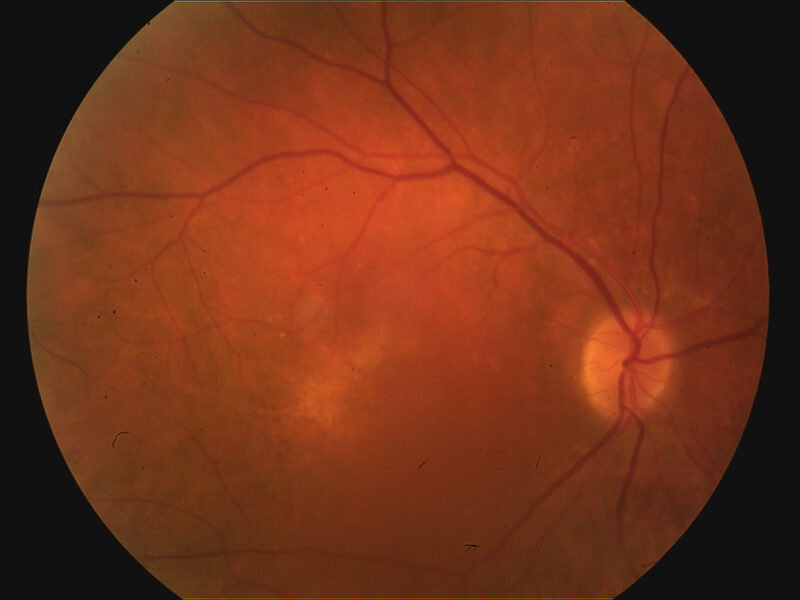 Dry Age Related Macular Degeneration with atrophy in a 75 year old woman in 2013. Photographs of the same patient taken in January 2019. Note the progression of atrophy. Clinical research trials investigating stem cell therapy, gene therapy and pharmacotherapy are being developed with the common goal to reduce the risk of disease progression and vision loss. Intravitreal injections are performed in the office for the treatment of macular degeneration, diabetic eye disease, retinal vein occlusion, and intraocular inflammatory conditions. The procedures are done under sterile technique and topical anesthesia. Patients describe only minimal, if any, discomfort. Many patients, in fact, come to our offices early in the morning to receive their scheduled injections, and then successfully return to work following their procedure. Intravitreal injections are usually done on a once per month basis until stabilization of your retinal condition is realized. Dr. Kanter will discuss with you your progress based on both clinical examination and serial retinal scanning via optical coherence tomography. Increasing the interval between successive injections and even eliminating the need for additional intervention is an important goal of therapy.